Change and motion define and constantly reshape the world around us, on scales from the molecular to the global. In particular, the subtle interplay between chemical reactions and molecular transport gives rise to an astounding richness of natural phenomena, and often manifests itself in the emergence of intricate spatial or temporal patterns. 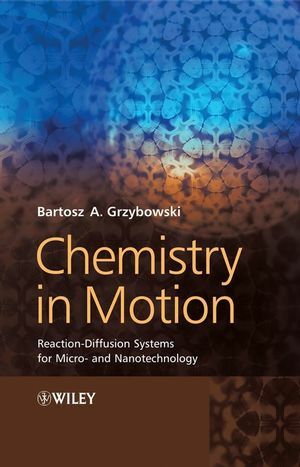 The underlying theme of this book is that by “setting chemistry in motion” in a proper way, it is not only possible to discover a variety of new phenomena, in which chemical reactions are coupled with diffusion, but also to build micro-/nanoarchitectures and systems of practical importance. Although reaction and diffusion (RD) processes are essential for the functioning of biological systems, there have been only a few examples of their application in modern micro- and nanotechnology. Part of the problem has been that RD phenomena are hard to bring under experimental control, especially when the system’s dimensions are small. Ultimately this book will guide the reader through all the aspects of these systems – from understanding the basics to practical hints and then to applications and interpretation of results. An overview and outlook of both biological and man-made reaction-diffusion systems. The fundamentals and mathematics of diffusion and chemical reactions. Reaction-diffusion equations and the methods of solving them. Spatial control of reaction-diffusion at small scales. Micro- and nanofabrication by reaction-diffusion. Chemical clocks and periodic precipitation structures. Reaction-diffusion in soft materials and at solid interfaces. Microstructuring of solids using RD. Reaction-diffusion for chemical amplification and sensing. RD in three dimensions and at the nanoscale, including nanosynthesis. This book is aimed at all those who are interested in chemical processes at small scales, especially physical chemists, chemical engineers, and material scientists. The book can also be used for one-semester, graduate elective courses in chemical engineering, materials science, or chemistry classes. Bartosz A. Grzybowski is Associate Professor of Chemical and Biological Engineering at Northwestern University in Evanston, Illinois (USA). He was educated at the University of Gdansk (Poland) and Yale University (USA) and gained his PhD at Harvard University (USA), where he also worked as a postdoctoral fellow. From 2001 to 2003, Professor Grzybowski was Director of Research (Concurrent Pharmaceuticals) and Associate of the Department of Chemistry and Chemical Biology at Harvard University. He is the recipient of several awards including the 2003 Camille and Henry Dreyfus New Faculty Award and in 2006 an ACS Division of Colloid and Surface Chemistry Unilever Award and he is the (co)author of over 70 papers. 1 Panta Rei: Everything Flows. 1.3 How Nature Uses RD. 1.4 RD in Science and Technology. 2.3 The Use of Symmetry and Superposition. 2.4 Cylindrical and Spherical Coordinates. 3.3 Ionic Reactions and Solubility Products. 3.4 Autocatalysis, Cooperativity and Feedback. 4 Putting It All Together: Reaction–Diffusion Equations and the Methods of Solving Them. 4.1 General Form of Reaction–Diffusion Equations. 4.2 RD Equations that can be Solved Analytically. 4.4 Temporal Discretization and Integration. 4.4.1 Case 1: τRxn ≥ τDiff. 4.4.1.1 Forward Time Centered Space (FTCS) Differencing. 4.4.1.2 Backward Time Centered Space (BTCS) Differencing. 4.4.1.4 Alternating Direction Implicit Method in Two and Three Dimensions. 4.4.2 Case 2: τRxn &Lt; τDiff. 4.4.3 Dealing with Precipitation Reactions. 4.5 Heuristic Rules for Selecting a Numerical Method. 5 Spatial Control of Reaction–Diffusion at Small Scales: Wet Stamping (WETS). Appendix 5A: Practical Guide to Making Agarose Stamps. 6 Fabrication by Reaction–Diffusion: Curvilinear Microstructures for Optics and Fluidics. 6.1 Microfabrication: The Simple and the Difficult. 6.2 Fabricating Arrays of Microlenses by RD and WETS. 6.3 Intermezzo: Some Thoughts on Rational Design. 6.4 Guiding Microlens Fabrication by Lattice Gas Modeling. 6.5 Disjoint Features and Microfabrication of Multilevel Structures. 6.6 Microfabrication of Microfluidic Devices. 7 Multitasking: Micro- and Nanofabrication with Periodic Precipitation. 7.2 Phenomenology of Periodic Precipitation. 7.4 Microscopic PP Patterns in Two Dimensions. 7.4.1 Feature Dimensions and Spacing. 7.4.3 Degree of Gel Crosslinking. 7.4.4 Concentration of the Outer and Inner Electrolytes. 7.5 Two-Dimensional Patterns for Diffractive Optics. 7.6 Buckling into the Third Dimension: Periodic ‘Nanowrinkles’. 7.7 Toward the Applications of Buckled Surfaces. 7.8 Parallel Reactions and the Nanoscale. 8 Reaction–Diffusion at Interfaces: Structuring Solid Materials. 8.1 Deposition of Metal Foils at Gel Interfaces. 8.1.1 RD in the Plating Solution: Film Topography. 8.1.2 RD in the Gel Substrates: Film Roughness. 8.2 Cutting into Hard Solids with Soft Gels. 8.2.1.2 Glass and Silicon Etching. 8.2.3 Microetching Transparent Conductive Oxides, Semiconductors and Crystals. 8.2.4 Imprinting Functional Architectures into Glass. 9 Micro-chameleons: Reaction–Diffusion for Amplification and Sensing. 9.1 Amplification of Material Properties by RD Micronetworks. 9.2 Amplifying Macromolecular Changes using Low-Symmetry Networks. 9.4.3 Wave Emission and Mode Switching. 9.5 Extensions: New Chemistries, Applications and Measurements. 10 Reaction–Diffusion in Three Dimensions and at the Nanoscale. 10.1 Fabrication Inside Porous Particles. 10.1.1 Making Spheres Inside of Cubes. 10.1.2 Modeling of 3D RD. 10.1.3 Fabrication Inside of Complex-Shape Particles. 10.1.4 ‘Remote’ Exchange of the Cores. 10.1.5 Self-Assembly of Open-Lattice Crystals. 10.2 Diffusion in Solids: The Kirkendall Effect and Fabrication of Core–Shell Nanoparticles. 10.3 Galvanic Replacement and De-Alloying Reactions at the Nanoscale: Synthesis of Nanocages. 11 Epilogue: Challenges and Opportunities for the Future. Appendix B: Matlab Code for the Minotaur (Example 4.1). Appendix C: C++ Code for the Zebra (Example 4.3).